Residents inspect damage after airstrikes by pro-Syrian government forces in Anadan city, about 10 kilometers away from the towns of Nubul and Zahraa, Northern Aleppo countryside, Feb. 3, 2016. The Syrian civil war appears to have entered a new and perilous phase for rebels battling to oust President Bashar al-Assad. Government forces, backed by Shi'ite militiamen from Lebanon and Iran, pressed an offensive Wednesday in northern Syria after breaking a three-year-siege on two towns 30 kilometers northwest of Aleppo, the country’s one-time commercial capital. In what one rebel commander described to VOA as the most “furious fighting” in northern Syria in the past five years, government forces managed to lift not only the insurgents' siege of the Shi’ite towns of Nubul and Zahraa, but, in the past 24 hours, seized nearby villages, severing the Aleppo rebels’ main supply line to Turkey. The rebels' plight worsened as nighttime approached Thursday. A rebel source told VOA there were more than 100 regime airstrikes on the villages of Rytian, Hayan, Hyritan, and Byanon. Some opposition media outlets denied the main supply route had been cut, but rebel commanders contacted by VOA either confirmed the regime’s claim or avoided answering. 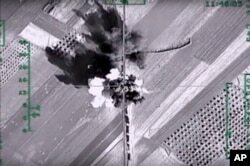 In this photo made from the footage taken from Russian Defense Ministry official web site, Feb. 1, 2016, an aerial image shows what it says is a column of heavy trucks carrying ammunition hit by a Russian air strike near Aleppo, Syria. The government's offensive, coordinated with round-the-clock Russian airstrikes that, this week, knocked out the last remaining big hospital in the rebel-controlled half of the city, marks not only one of the worst battlefield reversals for the rebels in the long insurgency against President Assad, but opens up the prospect for the rebels of opposition-held areas in Aleppo being subject to a prolonged government siege. 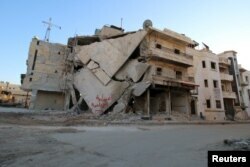 “In the last three days, Aleppo has witnessed a very furious attack. The regime has used heavy weaponry and everybody who is witnessing the battle has said it was the worst in the past five years,” according to Zakaria Malahefji, the political officer of the 3,000-member Fastaqim Kama Umirt, a brigade aligned with the rebel alliance Jaish al-Mujahideen (Army of Holy Warriors). Other rebel commanders agreed, saying the regime’s objective is to starve out the rebel-held portion of Aleppo, much as the regime did with another key city for the insurgents, Homs. Malahefji warned that a full-scale siege of opposition-held districts in Aleppo would look like “another Madaya,” the town northwest of Damascus which has been encircled by Assad's forces for the last seven months, prompting an international outcry. “But Aleppo is a bigger city and the humanitarian disaster would be bigger,” Malahefji added. A damaged building is seen in Hraytan city, about 10 kilometers away from the towns of Nubul and Zahraa, Northern Aleppo countryside, Syria, Feb. 3, 2016. Western and Gulf-backed rebels in Aleppo still have a longer and more difficult supply line west of the city running through the neighboring province of Idlib to Turkey, but it is also under threat now. Syrian government forces along with allied militiamen from the Lebanese Shi’ite movement Hezbollah and Iranian Revolutionary Guardsmen are pressing fierce attacks on insurgents in Idlib as well, say rebel commanders. “The pro-regime forces have encircled the rebel quarters in Aleppo from the south, east and north,” said Rami Abdel Rahman, director of the Syrian Observatory for Human Rights, a Britain-based monitoring group that relies on a network of activists for its information. “The regime forces have done in three days in Aleppo what they had failed to do in three years, thanks mainly to Russian support,” he added. Senior rebel commanders aren’t disguising the gravity of their position in the Aleppo countryside. “It seems there will be a decisive battle in the North,” said Ahmed al-Seoud, the commander of Division 13, a militia that has received aid from the United States and other Western countries including TOW anti-tank missiles. He said rebel militias were reinforcing as best they could. “We are sending everything we can,” al-Seoud said. One Islamist rebel militia, Harakat Nour al-Din al-Zenki, warned late Wednesday that it doesn’t have sufficient supplies to feed its 4,000 fighters. A rebel fighter, Mohammed Abu Islam, struck a defiant note to VOA, saying that insurgents were fighting back. “There are ongoing clashes; we are fighting with great nobility,” he added. He said Islamic State militants are seeking to exploit the regime's advances and have renewed shelling of the insurgent held towns of Mare'a and Tel- Rifa'at, close to the border with Turkey. Internally displaced Syrians fleeing advancing pro-government forces wait near the Syrian-Turkish border after they were given permission by the Turkish authorities to enter Turkey, in Khirbet Al-Joz, Latakia countryside, Feb. 2, 2016. Just before the government broke the nearly three-year-long siege overnight Tuesday on Nubul and Zahraa, moderate and Islamist rebel militias appealed for assistance from Jabhat al-Nusra, al-Qaida’s affiliate in Syria, which dispatched nearly 800 fighters in a 200-vehicle convoy from Idlib to try to shore up resistance. They are now battling to halt the regime’s offensive on the village of Ratyan, 13 kilometers from Zahraa. The government’s advance came after an unprecedented bombardment by government forces and intense airstrikes from Russian warplanes. According to the Syrian Observatory, more than 320 Russian airstrikes were launched in the Aleppo area in the first three days of this week. Malahefji put the number higher at 340 airstrikes. Photographs posted online from the Aleppo countryside showed pro-government forces using advanced Russian-made T-90 tanks that are equipped with defensive systems able to counter U.S.-supplied TOW missiles. The regime’s advance, the most significant since September, when Russia started its military intervention in Syria, has dimmed the chances of United Nations-backed peace talks, that began this week, being resumed after U.N. special envoy Staffan de Mistura paused them on Tuesday. The envoy was forced to announce a halt after Syrian opposition delegates pulled out of meetings in Geneva because of the Russian bombardment around Aleppo. The offensive in northern Syria was condemned Wednesday by France, whose foreign minister, Laurent Fabius, accused Damascus and Moscow of “torpedoing” the tentative peace talks in Geneva. Rebel leaders told VOA there is little chance of endorsing a resumption of talks later in February while the battle rages in the Aleppo countryside. “Assad won’t stop killing,” said Malahefji. That will only happen, he said, if he is beaten militarily. “We need Western support with heavy weapons that can stop the massacres,” he added. He appealed for the U.S. to lift its embargo on Syrian rebels being supplied with hand-held anti-aircraft missiles -- an embargo Western and Gulf allies have observed. The rebels have been appealing for years for such missiles but Washington has declined, fearing that any anti-aircraft missiles given to moderate or Islamist militias will be shared with jihadists and could be used by them to shoot down commercial airliners in the region. “This prohibition is inhumane and unethical... the regime’s airstrikes are causing massacres every day,” Malahefji said. Assad’s forces have been trying to encircle rebel-held areas in the city of Aleppo for more than a year and to cut their lines of supply from Turkey. The pro-Assad forces have come close to doing so several times, but a series of offenses aimed at surrounding the rebels were repelled, often at the last minute, or quickly reversed. A crucial crossroad at Handarat, less than 10 kilometers north of Aleppo, which controls the al-Castello road into the city, is key but regime forces have failed to capture it in the past. The regime now claims to have done so. 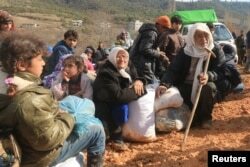 The fighting has spurred thousands of civilians to flee north of Aleppo to seek refuge in the Kurdish border city of Afrin. Aid agencies have warned many more will follow. The United Nations under-secretary general for humanitarian affairs, Stephen O’Brien, told Britain’s Independent newspaper Wednesday that there would be grave consequences, if Aleppo is besieged by regime forces. “What is happening in Syria is bad enough without something like that happening in Aleppo; but, if the situation there gets worse we will have a large population at risk and we would need to get immediate access for road convoys to provide the necessary humanitarian assistance” he said.